Ergonomics is the involvement of utilizing proper posture and equipment for people who must usually sit or perform repetitive tasks for a long period of time. It is the science of the body in correlation to the workplace, and how various jobs can impact one's health. Comfort is not only important to help maintain stress levels, but it also minimizes impact on the joints and other parts of the body when sitting or when strained for several hours at once. Implementing ergonomics in an office environment helps to ensure the physical well being as well as mental calmness of employees who must remain in one position for a long length of time. Using proper ergonomics can help to keep peoples' backs healthy, prevent problems like carpal tunnel syndrome, and promote healthier posture. There are many health related issues that can affect people working in an office or students who must sit down in classrooms for a long stretch. Repetitive strain injuries are quite common, and have been known to cause permanent and painful disabilities. Carpal tunnel is one of the most common forms of these injuries, and often results because a person is not positioning their wrist, back, and legs properly. When this happens, strain begins to become focused on the wrists and hands, causing injury. Other problems that can arise from improper posture include joint and knee pain, back injury, and eye strain. Poor circulation can also result if the legs are not positioned properly when seated. When ergonomically designed desks and chairs are used, people's overall posture is improved and strain can be evenly distributed throughout the body. This prevents any one area from having to bear too much strain at once, and the body is now working in synergy. Wrist guards and supports at the keyboard are good ways to help keep the wrists from hurting, and office chairs with the right back support should help employees or students remain seated upright and keep their backs supported at all times to avoid pain. If good posture and proper ergonomics are ignored, many different problems can arise. People who sit at desks and type heavily often experience painful wrist and hand problems. If they are not seated in the right position, they will also experience leg pain, back pain, and improper circulation. All of these things are in sync together and one problem can begin a snowball effect on the entire body. Another problem that can arise is too much strain on the eyes. Screens should be the right size, and workers should be seated at a fair distance from them to avoid strain. Sitting in chairs that do not support the legs and back the right way can cause harm to the arms, joints, and feet. Training in posture and how to work efficiently without causing too much pressure on the body are important things to learn. These steps, if taken proactively, can help people avoid the many different problems that can come with repetitive strain injury. Ergonomics Basics ��� What ergonomics is, what it can help prevent, and more. Musculoskeletal Disorders ��� Information about how ergonomics can have an impact on the musculoskeletal system. Ergonomics and Labor ��� Read more about who is affected by ergonomics and how it can help people in the workplace. Ergonomic Checklist ��� This quick checklist exhibits the many aspects of what should be included in an ergonomically correct environment. Standing ��� A simple diagram that illustrates proper ergonomics for people who must stand up while working. Setting up Your Workstation ��� This simple guide can help you ensure your workstation is set up in an ergonomically correct fashion. 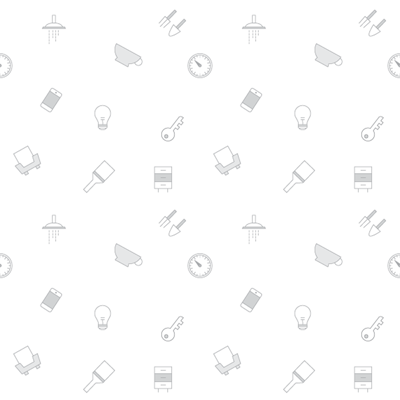 Ergonomics Web ��� A comprehensive website dedicated to all things ergonomics. 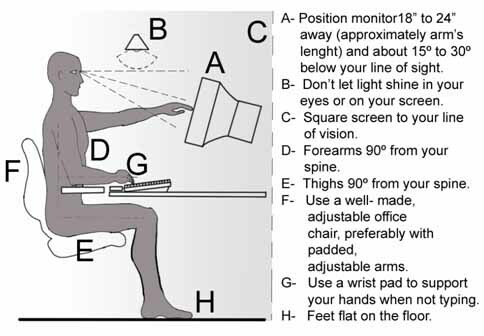 Desk Positioning ��� This graphic illustrates how your computer desk should be set up to avoid strain. Computer & Desk Stretches ��� Here are some simple exercises you can do to keep your back and neck stretched properly. Lifting & Handling ��� Some advice on properly lifting and handling materials in the workplace to avoid back issues. Workstation Guidelines ��� This site provides another helpful guideline on setting up a computer workstation. Nutrition & Ergonomics ��� An article that examines how nutrition can play a role in ergonomics. Problems & Solutions ��� Some common ergonomically related problems and how they can easily be solved to prevent further injury. Choosing ergonomic chairs ��� Examples of how to properly select, use and install chairs, keyboard trays, and more. Carpal Tunnel Syndrome ��� Learn more about the most common problem that workers experience. Common Problems in Office Ergonomics ��� This page discusses the challenges for setting up office equipment. Computers & Eyestrain ��� More information about how employees and students may experience eyestrain, and how to prevent it. Ergonomics 101 ��� A good resource for what causes strain, how to avoid it, and what ergonomics can do to help. Ergonomics & Health ��� Some more information about strain and ergonomics. MSDs ��� What are musculoskeletal disorders? Find out here. Ergonomic Gifts ��� This page features five ergonomic gifts that can help prevent pain. HFES ��� Home website for the Human Factors and Ergonomics Society. Ergonomics Working Group ��� This organization is dedicated to promoting proper ergonomics for the working class and military. National Ergonomics Month ��� Check out more at the National Ergonomics Month website. Ergonomics & Computer Injury ��� Read more about common computer related injuries and how they can be resolved. Handle With Care ��� This is a very helpful page for nurses, who often suffer from injuries related to sitting or standing too long. Ergonomics is the involvement of utilizing proper posture and equipment for people who must usually sit or perform repetitive tasks for a long period of time. It is the science of the body in correlation to the workplace, and how various jobs can impact one's health.